The Meridian at Stone Creek was a lovely facility. It was very clean and looked almost brand new. We had a very nice tour. It looked like the services for the residents were nicely set up for them and all their needs looked like they were being met. Everyone seemed like it was a good experience for them, so we were pleased with what we saw. I saw many people eating and the food smelled good. It looked like they were having a lovely dining experience. They were about to go on a trip when I was there, and I was shown a list of activities. The lady who gave me the tour was very helpful, accommodating, and told me what I needed to do with my family to help us find a care facility for my mom. We visited The Meridian at Stone Creek. It's a beautiful building and it has beautiful rooms. Their memory unit was expanding under construction, so we didn't get to see it. It was affordable. We only met the receptionist who was very pleasant and the person who gave us the tour, who was was very knowledgeable, but a little pushy, so that was a bit of a turnoff. It's a little bit isolated. They had a very attractive unit of independent living, which is townhomes and cottages. Residents can transition from independent living to assisted living. It's a really lovely setup. They have an exercise room, personal trainer, and physical therapy. We had a good tour at the Meridian. They were very nice, they really did a good job, and they actually had a bar. We saw a studio, and a 1-bedroom, and they were very nice, updated, and modern. The staff was wonderful and courteous. The Meridian at Stone Creek was absolutely gorgeous, and the staff was lovely. The dining area was very elegant and more restaurant-style, so you can go in during various times of the day and still be served, so it's a little bit better for residents. My Father in law has been a resident in the Memory care Unit at Meridian since April 2016. We toured several other facilities, and did a lot of research before choosing Meridian as his home. I am a RN who expects and looks for a high quality of care in any health care facility. We have been beyond impressed with the care my father in law has received since his admission. He has been content, calm and happy in the memory care unit at Meridian. William, (Director of Memory Care), and the caregivers are very knowledgeable about caring for someone with dementia, and treat each resident with respect and dignity. William is an incredible advocate for the residents. If anyone spent any time in the Meridian Memory care unit, it is obvious William and the caregivers give outstanding care. Each resident's plan of care is individualized and adjusted as needed. They treat the residents as their own family members. Even better, my mother in law lives in the attached independent apartment. She has a very short distance to walk to visit my father in law. The facility is very clean, with lots of activities. My mother in law is quite happy. Not only do we have peace of mind, with our Father in law living at Meridian in the memory care unit, we actually are cherishing and enjoying time with him, even with his dementia diagnosis. The Meridian at Stone Creek had large facilities and large cottages, so we liked that. We didn't like the fact that they didn't have air conditioning in the rooms. The restaurant seemed nice. We didn't like the area because it's kind of isolated out in the woods, which is actually very nice, but you have to drive quite a distance to get to any store. They had very nice cottages with a few different floor plans. It seemed like they had a good program of activities like sewing and exercises. It is a little costly. The best way to get to know a community is by scheduling a tour. See the facilities, meet the staff and residents, and get a feel first hand what it's like to live at The Meridian at Stone Creek Assisted Living. A community nestled within manicured landscaped grounds and surrounded by the natural beauty of the Pacific Northwest, The Meridian at Stone Creek is an excellent option for seniors seeking a supportive and relaxing retirement experience. Offering both independent, assisted living and memory care options, seniors who need a little extra help can receive it, while those who don't can enjoy their independence with peace of mind. Seniors residing at our community enjoy the comfort of either a free-standing two-bedroom cottage or a spacious apartment. Your new home has a fully equipped kitchen, washer/dryer and vaulted ceilings. Monthly rent covers most utilities, save cable and phone service. We are also a pet-friendly community, so seniors are welcome to bring along their furry loved one. Restaurant-style dining is always on the menu in our community dining room, and meals are prepared from the freshest ingredients. There is also a coffee/breakfast area where you can gather with friends to start the day. To help keep residents engaged and active within the community, we offer a variety of events and activities for seniors to participate in as they see fit. We want seniors residing here at The Meridian at Stonecreek to enjoy as relaxing of a retirement living experience possible. For this very reason, we provide all accommodations with regular housekeeping and linen services. In addition, we are happy to offer local transportation services for residents to go shopping, run errands and reach medical appointments. An on-site concierge is on hand to answer any questions that might arise. As you need assistance to remain active, we are proud to offer help and assistance with a variety of activities of daily living. This can be as simple as a helping hand getting to and from meals to more detailed assistance with dressing or personal hygiene. All care services are adjusted to meet each resident's needs and preferences. 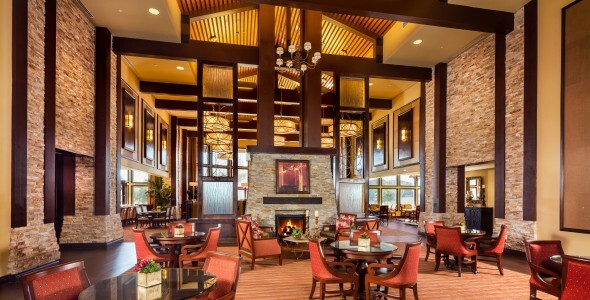 For Western Washington seniors seeking luxurious senior living, look no further than The Meridian at Stonecreek.